Excellence, quality, good taste, sophistication and style; this basket has it all. From imported Caviar to Wild Alaska Smoked Salmon; from the Italian snack Crisps to the European Cookies; from the Smoked Gouda to the Cranberry Cheddar Spread; they will be able to indulge in the finer things in life when they receive this bountiful gourmet gift basket! 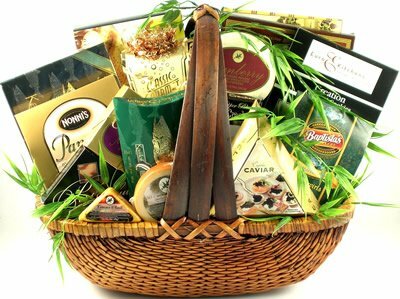 This gift basket offers an indulgent collection of some of our most sought after gourmet items. It's definitely large enough for a group, but also offers the perfect way to make a grand impression to an individual or family! It includes, Port Salut Cheese Spread, Merlot flavored Cheese Spread, Cheddar Cheese Spread mixed with Cranberries, Smoked Gouda Cheese, Tomato & Basil Cheese, 6 ounces of Wild Alaska Smoked Salmon, Panetini oven baked Italian Toast, a large assortment of gourmet Crackers, "Classic Gourmet" Cocktail Mix, Focaccia Crisps, imported Caviar, Smokey Mozzarella Cheese Swirl Snacks, Jalapeño Cheddar Cheese Straws, "Europe's Best" assorted Chocolate Dipped Cookies, fresh baked and crispy Tiramisu Cream filled Wafers, Honey Roasted Cashews, Sweet Chipotle Almonds, Roasted Pistachios, Tavolare Savory Snack Mix, Green Olives with Provencal Herbs, Wolfgang-Puck European Style Coffee, Irish Cream Coffee and exotic Tazo Tea! Now that's a gift basket! Excellence, quality, good taste, sophistication and style; this basket has it all. From imported Caviar to Wild Alaska Smoked Salmon; from the Italian snack Crisps to the European Cookies; from the Smoked Gouda to the Cranberry Cheddar Spread; they will be able to indulge in the finer things in life when they receive this bountiful gourmet gift basket! A short description couldn't do this enormous gourmet gift any justice - see description for complete product details! Christie Southern Butter Pecan Cookie Dough, 1.45 Ounce -- 165 per case.